THOMAS DEKKER » Blog Archive » 2 new magazine features! Thomas Dekker is featured in 2 magazine features this month, both thanks to the wonderfully talented Amanda Rebholz. You can purchase both of these magazines internationally and I would recommend doing so – they both sound fantastic and capture much more of Thomas’s delightful eccentricity and personality. There is a detailed interview with Thomas conducted by friend and colleague Amanda which will be sure to give it a unique slant. It also features a stunning photo shoot from the photographer with Thomas perhaps as you’ve never seen him before. 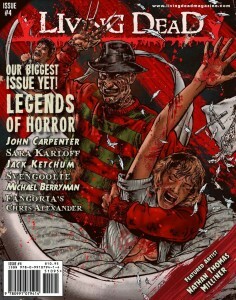 You can buy this issue at the Living Dead Store and including postage and magazine cost it is £10.15. There is a 5-page feature on Thomas featuring photographs by Amanda Rebholz and again, this is like you’ve never seen before. You can purchase your digital copy here.